The School House is an early 17th century Grade II listed thatched mid-terrace cottage, which served as Sidford Village school from 1846 - 1927. It has been thoughtfully and carefully restored to make superior holiday accommodation, retaining many original period features. 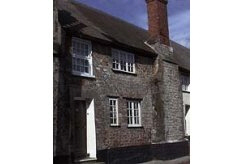 This holiday cottage is in the heart of Sidford Village and just 2 miles from Sidmouth beach. Two steps lead to the original solid oak door and reception hall with mid-Victorian coat hooks. The inner hall leads to a spacious antique pine panelled lounge/dining room with stylish mix of antique and contemporary furnishings and original Victorian tiled fireplace with open fire. There is a TV and video player for guests entertainment on rainy days. The small but well equipped kitchen features hand carved antique pine cupboards, drawers and plate racks, as well as a gas cooker, microwave oven and many interesting decorative touches including feature windows overlooking the pretty garden. The conservatory/sunroom features cane furniture, quarry tiled floor and a door leading to the garden. The large, light bathroom with it's exposed beams, features a pine panelled original Victorian bath with shower attachment and Victorian tiled surround, vanity basin and WC. An antique pine storage cupboard houses the automatic washing machine. Moving upstairs, bedroom 1 is of a good size and decorated in a traditional blue and white floral theme with twin single wrought iron beds, vanity unit and cupboard wardrobes. Bedroom 2 is beamed with a double iron bed and vanity unit. Bedroom 3 is small with a single bed and pretty linens. There is an enclosed, secluded, walled garden with stepping stones, ornamental fruit trees, herb and shrub borders - a suntrap! Look for the fairy elf's face in the wall! The rental charges below include gas and electricity. Pets are welcome with careful owners. 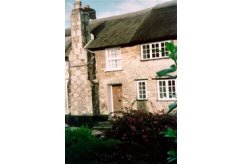 The cottage is close to village shops (including a spar shop, chemist and post office), inns, churches and tearooms. Coach trips can be arranged through the local Post Office. There is a frequent bus service to Sidmouth esplanade. You can also walk through the nature reserve, by the river to Sidmouth, which is about a half hour walk. There is a big Waitrose and Summerfield in Sidmouth. Enjoy the open fire as well as full gas central heating. Free car parking is available in the nearby local public car park (c. 200 yards away) up to 2pm and after 6pm, as well as outside the property between 6pm and 10am and all day Sundays. There is also street parking about 100 yards away. Sorry no smoking. Guests should bring their own bed linen.